Beautifully remodeled townhome. All furniture and appointments were purchased specifically for this condo with a carefree style and a designer touch. The entry level has hardwood floors through out including living room with gas fireplace (no wood needed), sectional couch for comfy seating, flat screen TV and DVD, 1/2 bath, dining table that will seat 6-8 comfortably and full kitchen (very well stocked!) with granite counters . Upstairs bedroom 1 has a double bed, bedroom 2 offers a Bunk bed plus a Double bed. There is a full bath with tub/shower in the hallway. The master suite has a Queen bed and full bath with shower and walk in closet. A private fenced and furnished patio off the dining area includes a gas grill for summertime seating, sipping and searing! Wireless Internet is included. Please note we are in the mountains and sometimes there are problems with the internet that are out of our control. There are 2 parking spaces directly in front of the unit. All others must park in the overflow area. The complex offers 2 swimming pools, tennis courts and sauna in the summer and a year round hot tub. 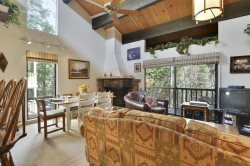 Just about 2 miles from Tahoe City, this condo is close to all the fun that Tahoe has to offer! In summer Skylandia Beach park is a short walk away and you can take the designated bike and pedestrian path all the way to downtown. Wife, 5 sons, and my best friend, best vacation of our lives so far!